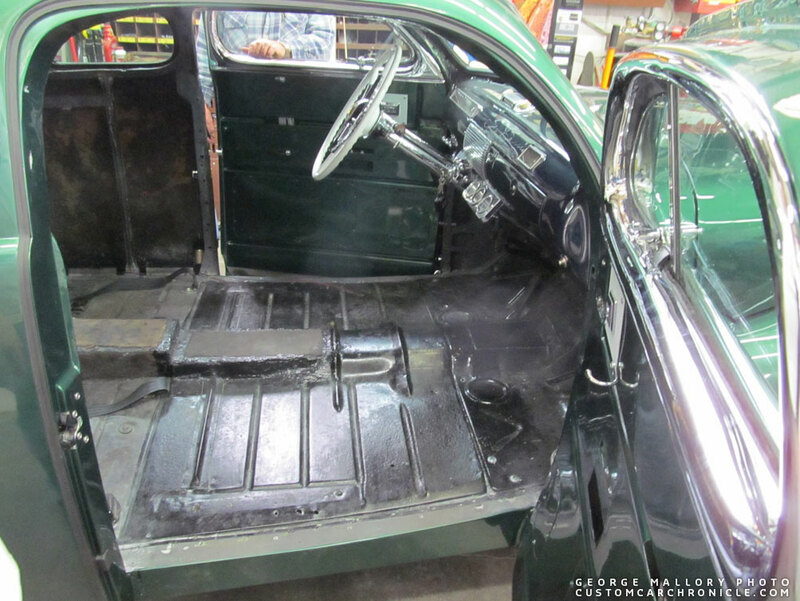 A look inside the 1941 Snooky Janich Ford Barris Customs body-work that normally is hidden behind upholstery and other panels. 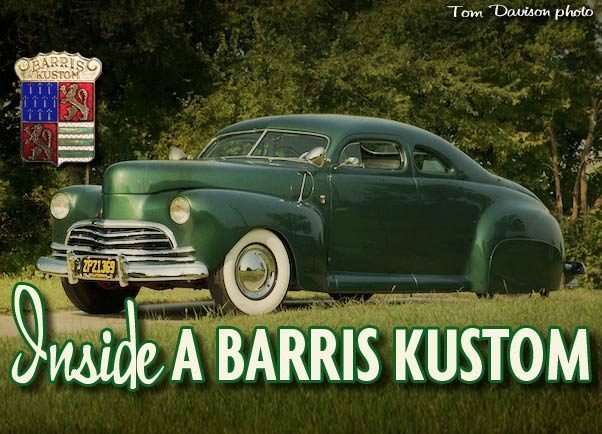 We all have seen many photos of finished Custom Cars created by the Barris shop in the late 1940’s early 1950’s. And thanks to George Barris’s amazing photo collection and Kustom Technique and other books, we also have seen a lot of photos of the guys in the Barris Shop creating these Barris Kustom Cars. Most of those early progress photos were shot from the outside, seeing the finished outside work done on the cars. But it is still rather seldom we are able to see all the work done on those early Customs from the inside, the backside of all this beauty. A look at work from the side that was always hidden behind the upholstery, interior panels, or underneath the car, was mostly left to those who had the fortune to own one of these classic customs, or had the pleasure to work on them. 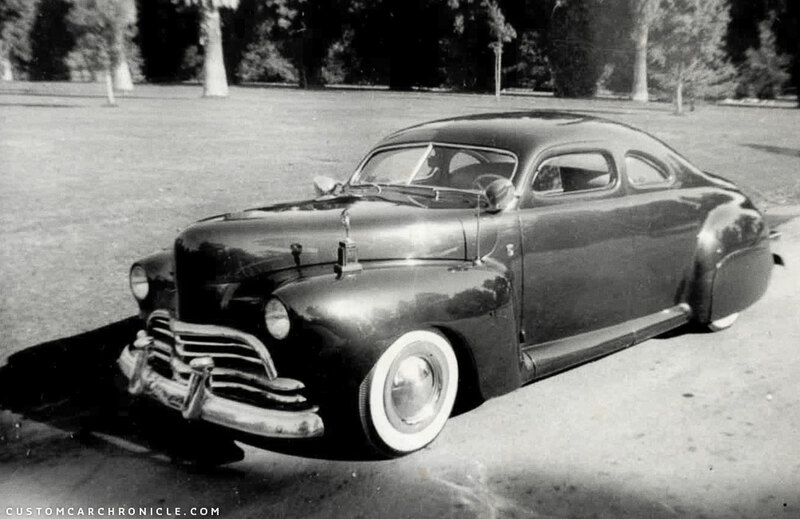 George Mallory has been the owner of the Barris Kustoms Restyled 1941 Ford known as the Snooky Janish Ford. In the last couple of years he, and a select team of experts, have been restoring this late 1940’s created Custom. During the process George has taken many photos. Capturing the old Barris Work from a side not to many people have been able to see. This is how the Snooky Janich Barris Restyled 1941 Ford Business Coupe looked in the mid 1950’s. While the body work done in the 1940’s and 1950’s most of the times looked very good on the outside, where it really mattered, it kind of lacked finesse and finishing on the inside, the side which did not really matter. Today we are perhaps a bit spoiled, seeing craftsman working hours and hours to get a body modification look as perfect from the outside as well as from the inside. With the huge amount of cars produced by the Barris Shop in the 1940’s and 1950’s this kind of perfection was not an option, neither wanted. Most of these Customs were not created to last an eternity like a lot of the cars that are being created these days. They were created to last perhaps a few seasons, To enjoy the moment, before perhaps being further modified. Of course there were always exceptions and some shops spend far more time creating good and beautiful modifications, no matter from where you looked at it. 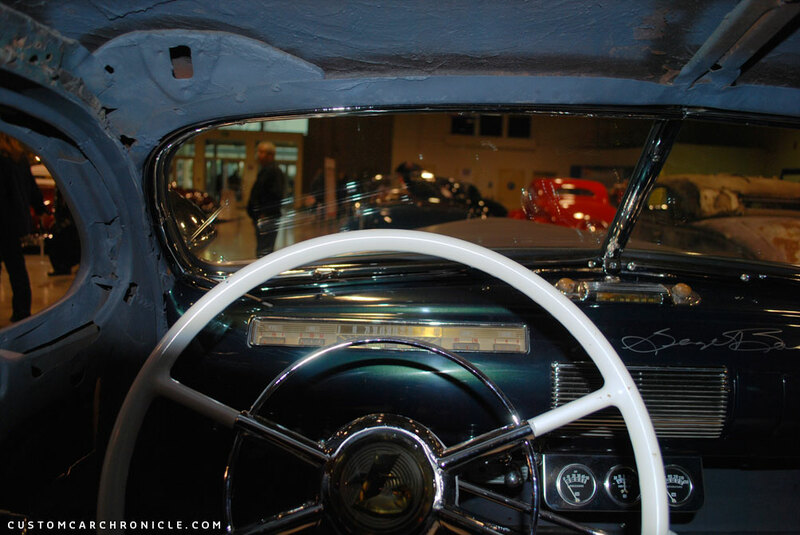 For instance the Valley Custom Shop was known for the exquisite work thru-out the cars. But overall the most attention was on the outside, and the inside was finished as practical as possible. 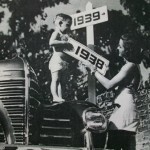 One of the customs modifications on the ’41 Ford was removed running boards. To cover the gap, the doors were extended down, with a round shaped panel. This panel was “hold” in place with a series of brackets welded to the bottom of the door and this shaped panel. In this photo we can see the bottom of the doors have been badly rusted due to water trapped inside, and the brackets have all been bend badly. 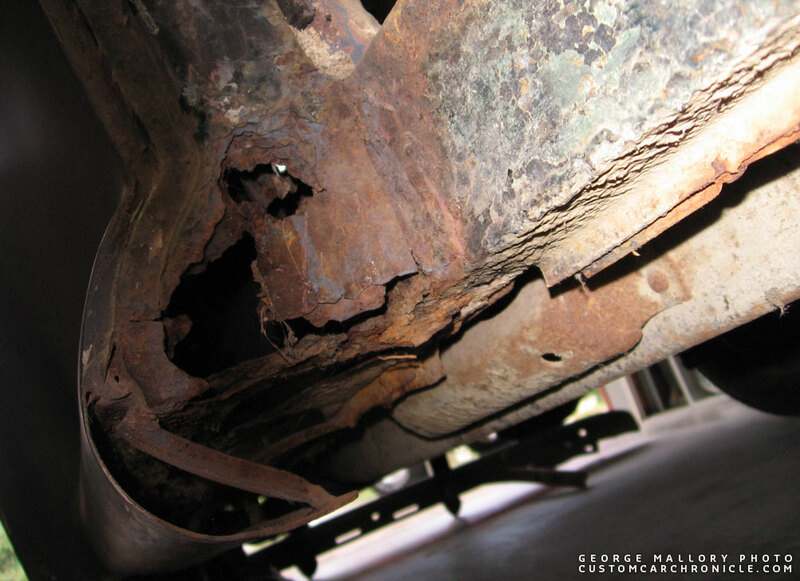 This photo shows the badly rusted lower section of the door jambs, and the rolled panel on the lower section of the rear quarter panel. 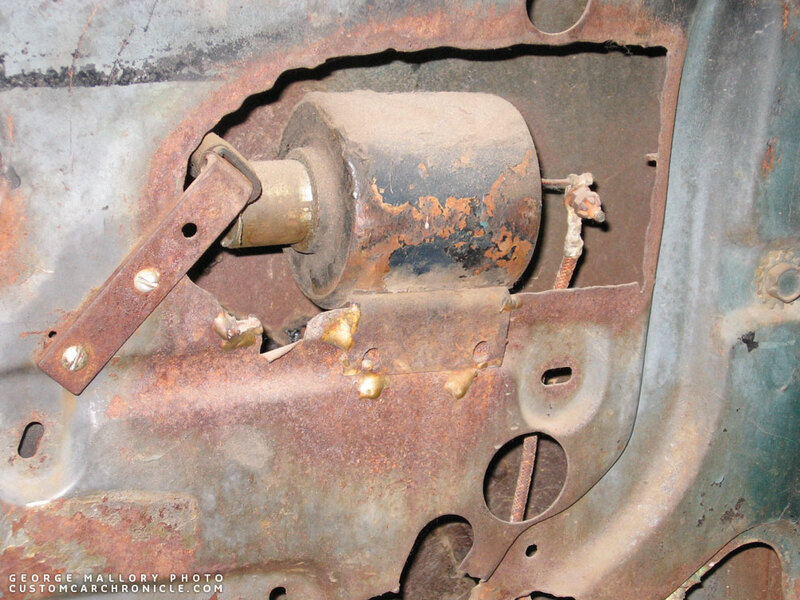 The photo shows the rolled lower panel and how a welded rod keeps it in place. It also shows that the open space is ideal for mud and moisture to find its way to corrode the surrounding metal. In the restoration it was decided to close these panels up to prevent future rust. 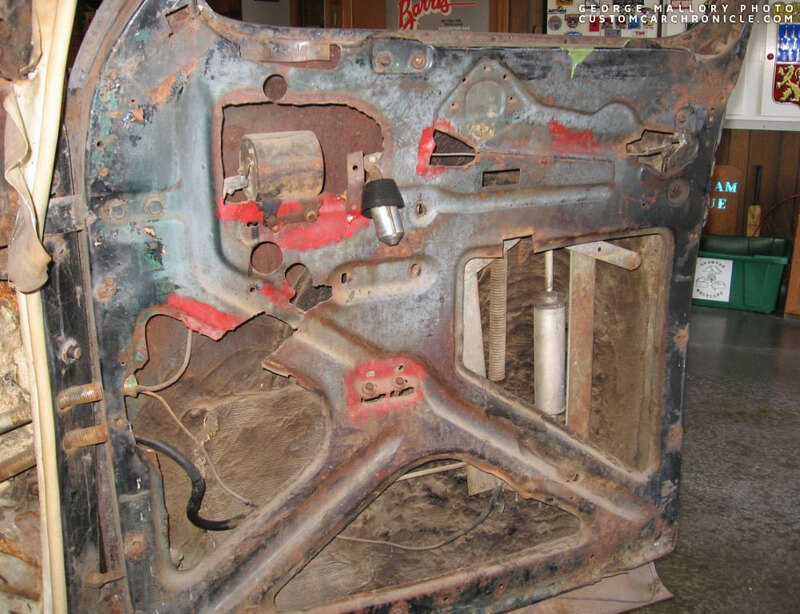 During the first round of restoration the rolled panel was repaired, and new rods welded in place. The big hole was added for the foot controlled push button to open the doors. 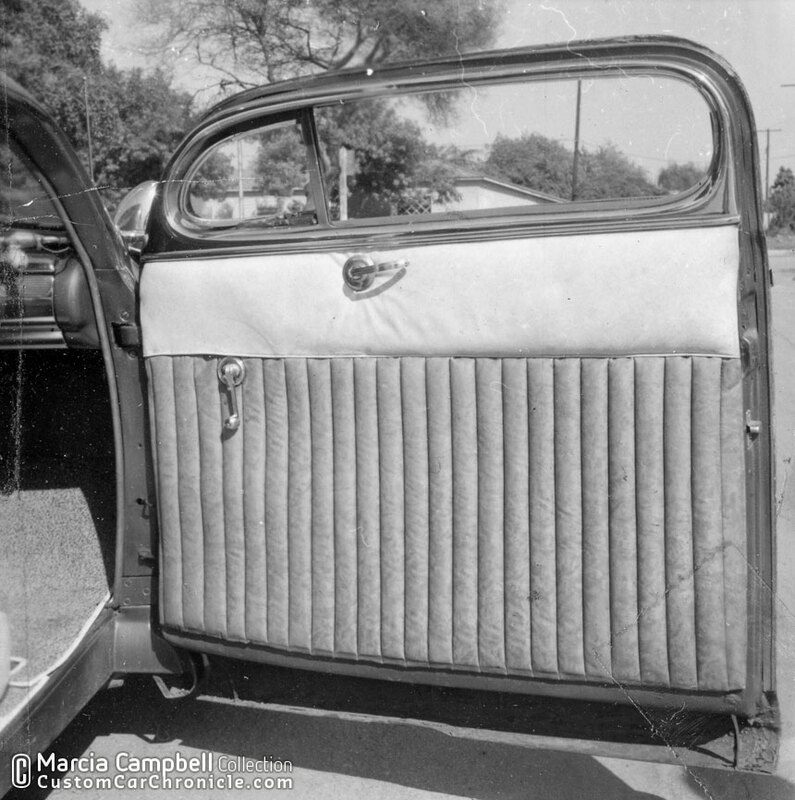 This mid 1950’s photo of the Barris Restyled 1942 Ford for Marcia Campbell (owned by Anne DeVall when this photo was taken), shows a similar treatment on the bottom of the doors to eliminate the running boards. 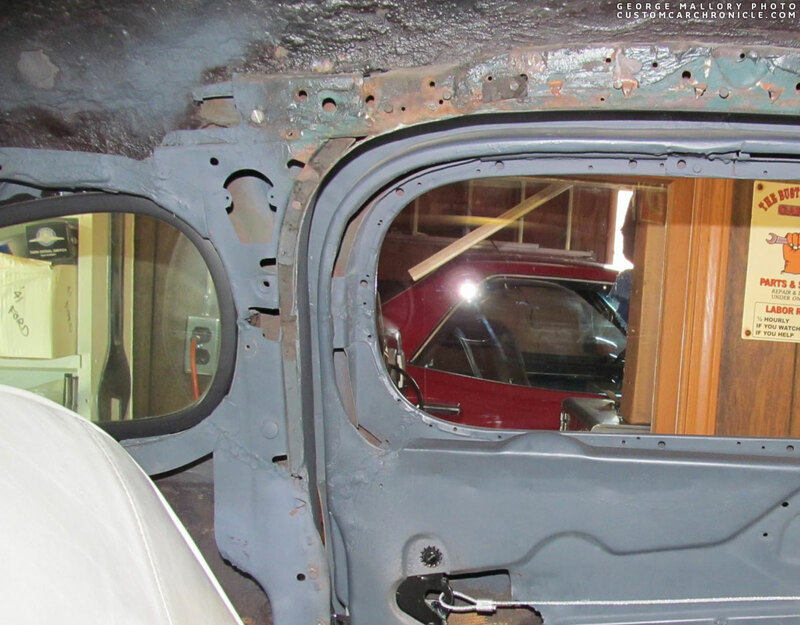 Passenger side door panel shows how the inner structure has been partly cut way to allow the electric door openers, and hydraulic power window unit to be installed. The door openers are most likely installed in the late 1940’s while the power window units are most likely a later addition. 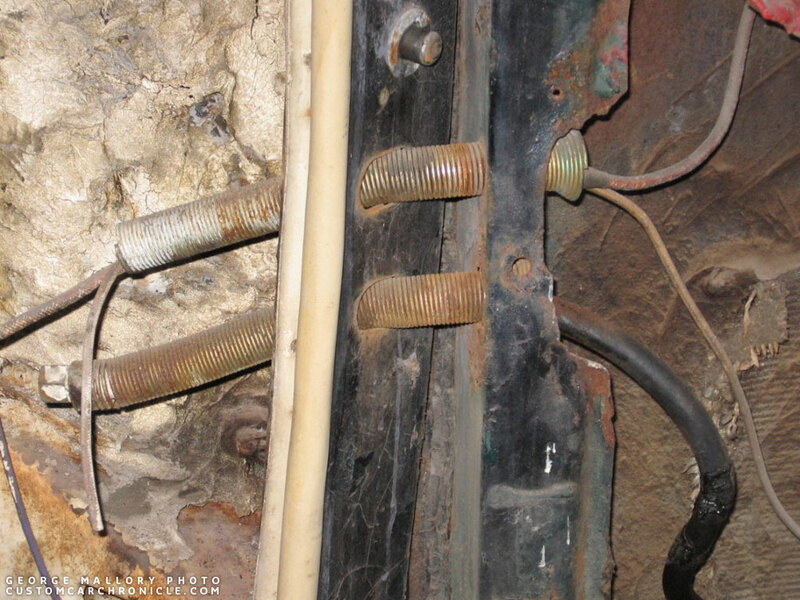 Electrical lined are routed thru door jamb mounted round-wire-springs at the front of the doors. 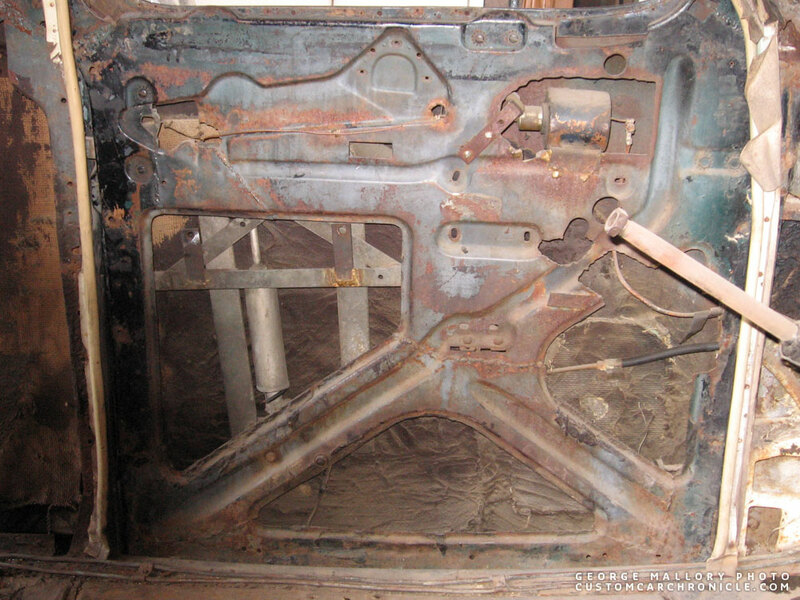 The drivers side door panel shows the similar rough work done to make the added parts do their work. Remember once the interior panels were installed, non of this rough cut and weld work would be visible. The solenoid for the door was placed inside an opening that was cut out in the inner door-panel, rough made brackets hold the unit in place. There have been a few more early that have been restored in the past couple of years that show similar working techniques. One of them is the Jack Stewart 1941 Ford that was restyled by the Ayala’s and finished by George Barris. One of the things we have seen on both cars is the use of the tar kind material on the underside of the roof and other panels. And sometimes this tar is covered with a course fabric which was used as temperature and sound insulation. The rear side window garnish molding are missing from the car, so they had to be recreated. It does give us a good look at the inside of the quarter window and what was done to get it in the shape needed. The piece of wood was added by the upholsterer. 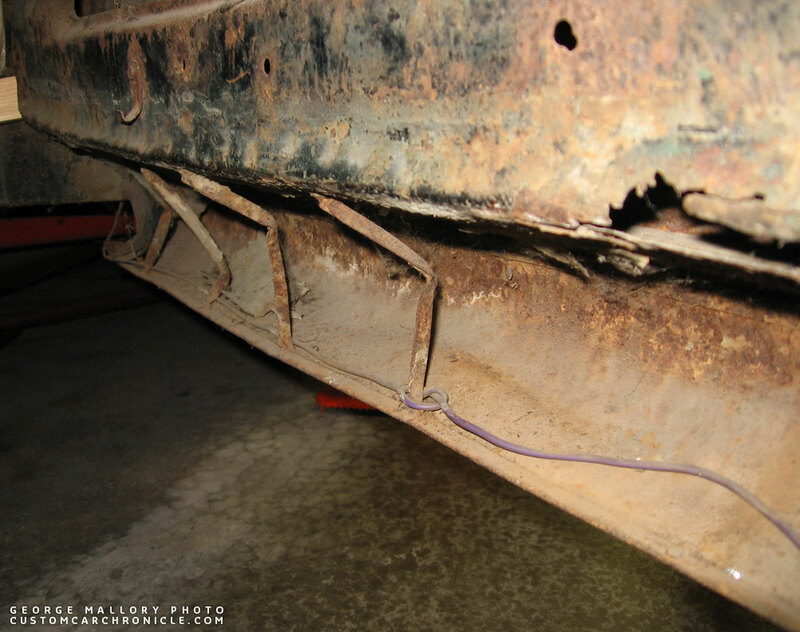 Notice that there once was a dual frenched antenna on this car, which has been welded shut later as well. All the braces at the back were cut, shaped and welded in the right shaped to fit with the new chopped and reshaped roof skin. 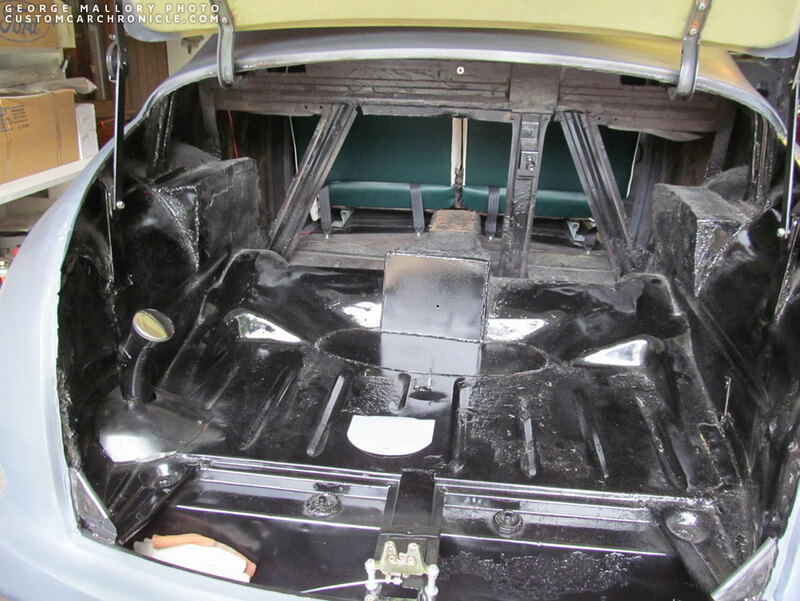 Most of the inside of the body was covered with a special brush on tar that was used for sound and temperature insulation. Some sections also had some kind of fabric glued in place. 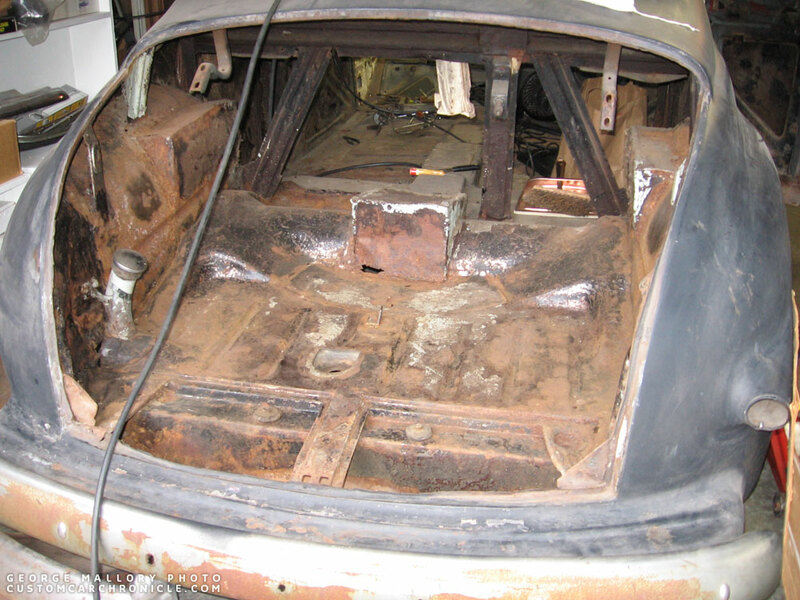 A lot of cutting shaping and welding was done around the b-pilar and top of the door frame. All this was covered by the window garnish moldings on the finished car. A lot of cutting and welding was done inside the trunk space as well. To make space for the lowered rear axle, move the gas-filler into the trunk and create a raised tunnel for the drive shaft. 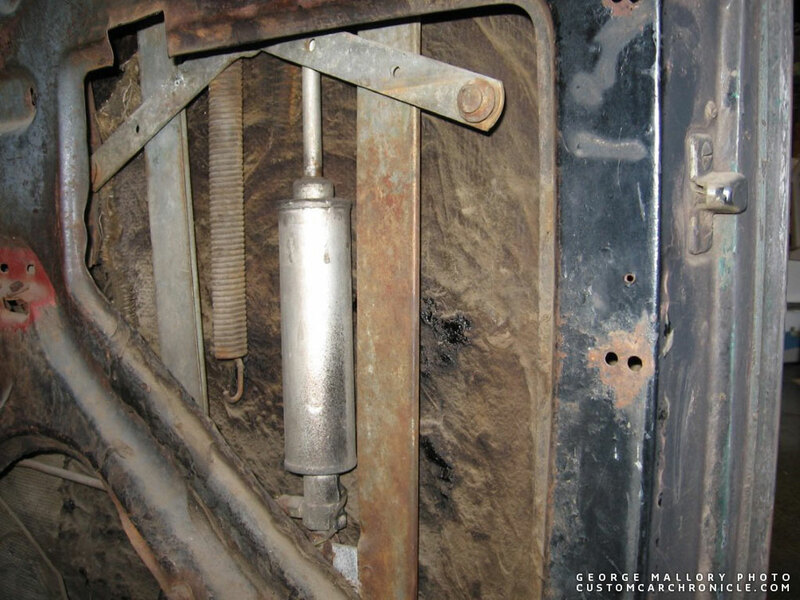 The gas filler tube was repositioned inside the trunk. 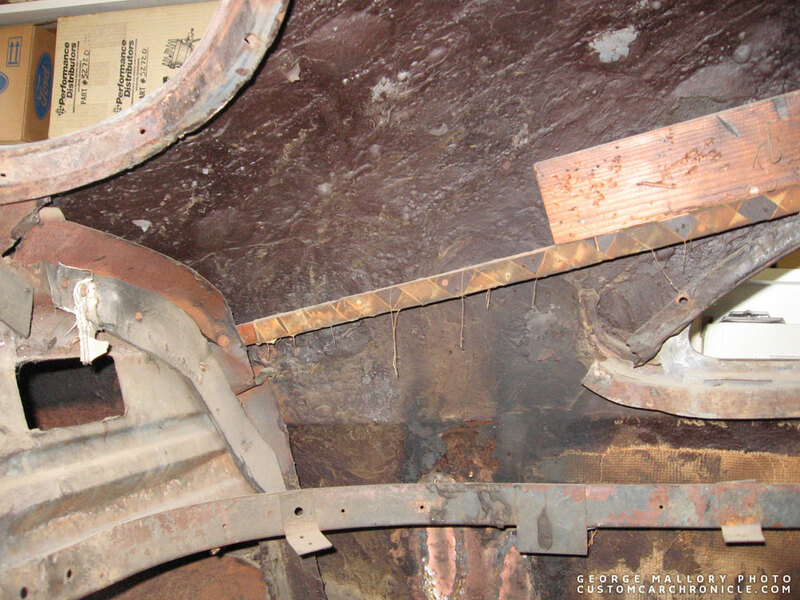 Viewed from the passenger door opening towards the back we can see the work that had been done to raise the drive shaft tunnel and to make space for the rear axle. The brackets are used to support the catwalk. 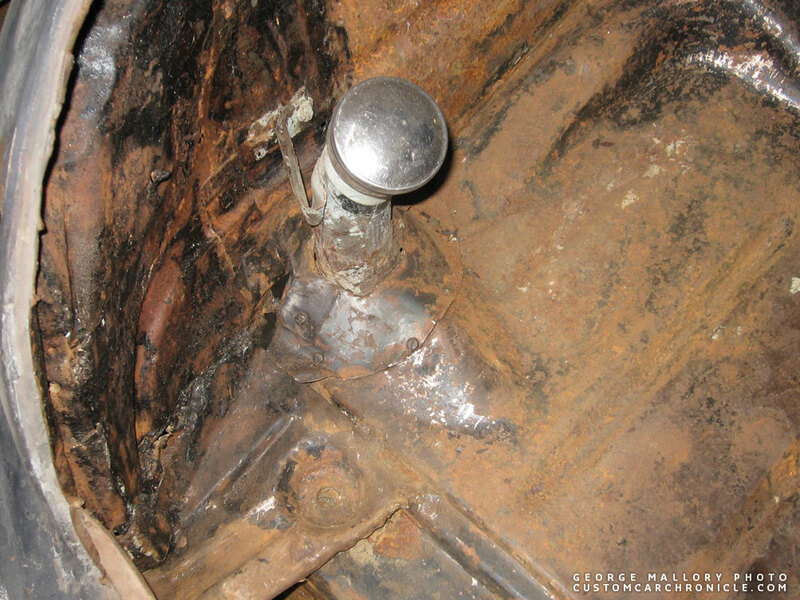 This is how the trunk looked after the restoration work had been done. 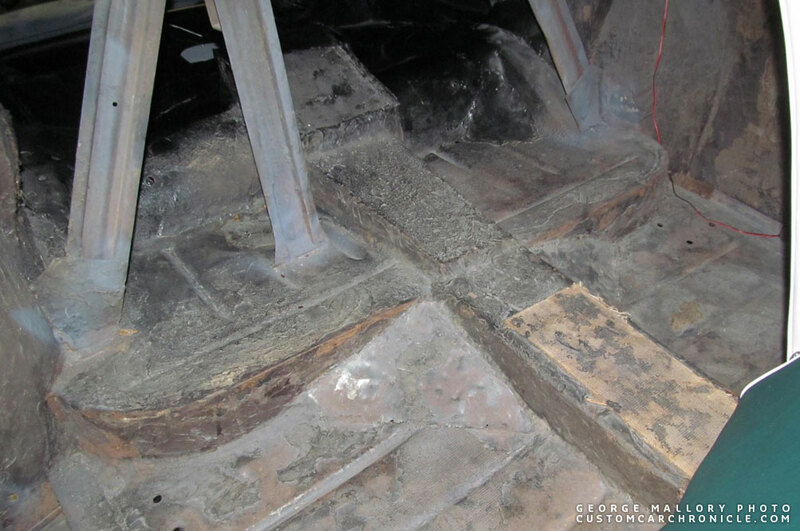 The floor board after the restoration work. 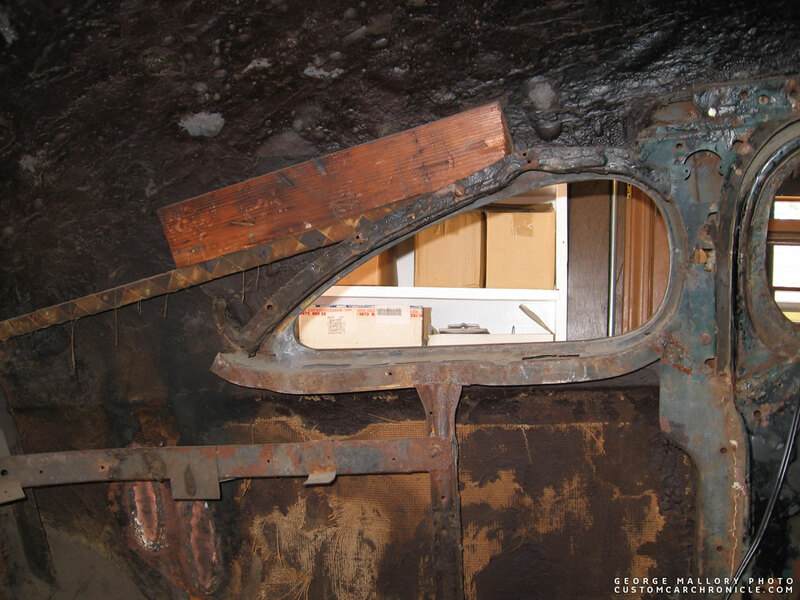 It appears that the drive shaft tunnel was raised, and then a portion was lowered an inch or so to make space for the front bench. Originally the ’41 Ford had taillights mounted in the 1946 Ford bumper guards. But after the car had been in an accident damaging the rear it was decided to redo the taillights and 1939 Chevy units were molded into the rear quarter panels. 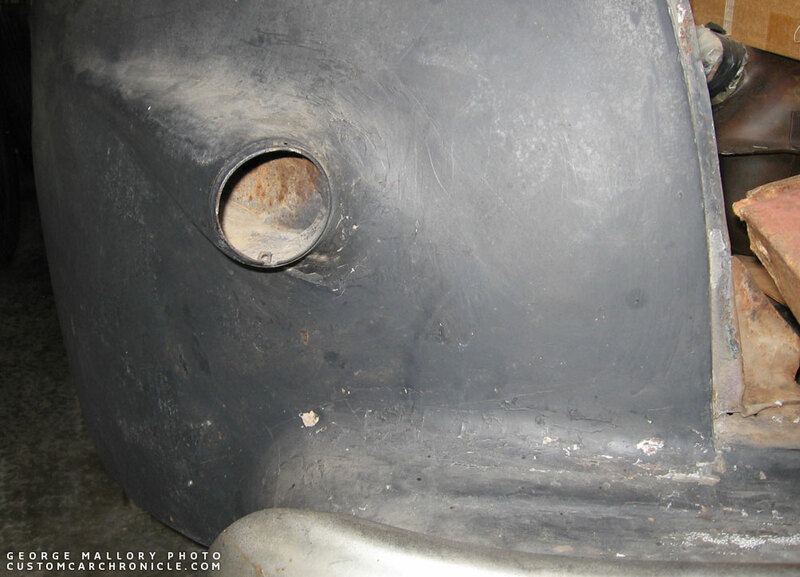 Here the actual taillights have been removed, so we can look inside the molded-in ’39 Chevy pods. 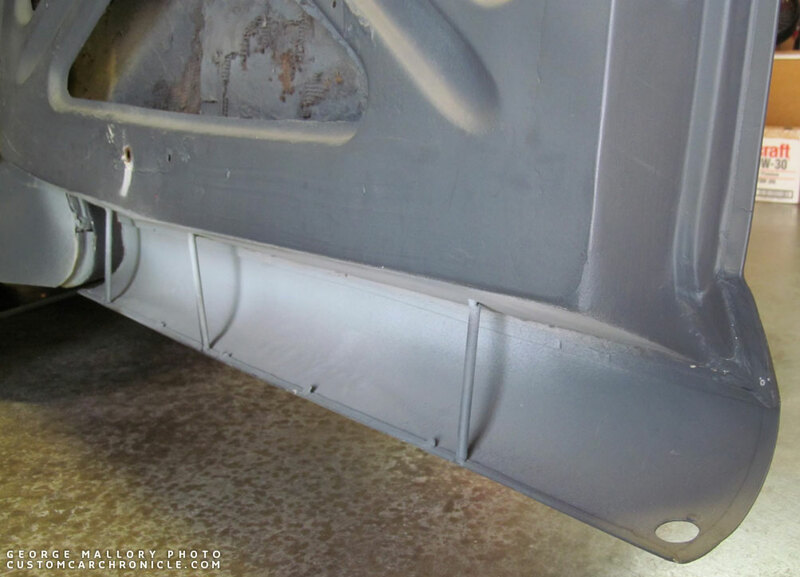 The restoration was going to be to the first bumper guard mounted tailights. So the molded-in Chevy taillights had to be cut off. 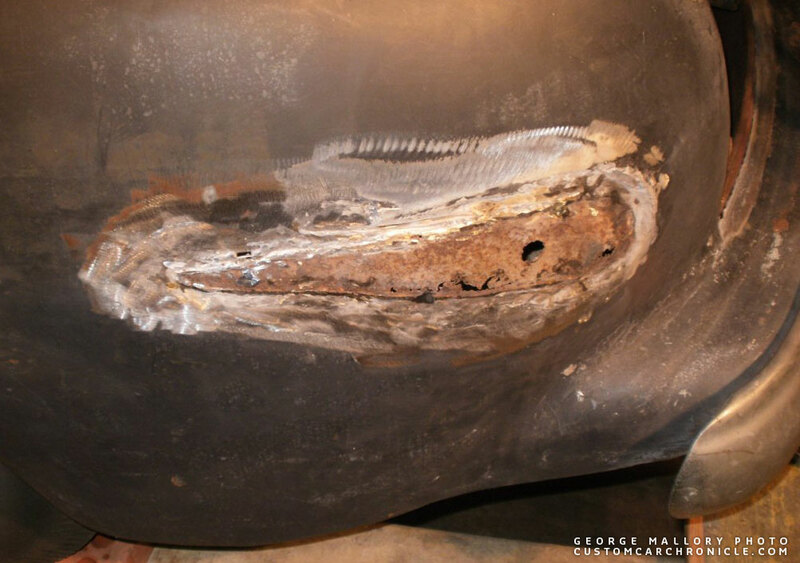 Notice how trapped moisture in the molded taillight caused the rear fender to rust out over the years. 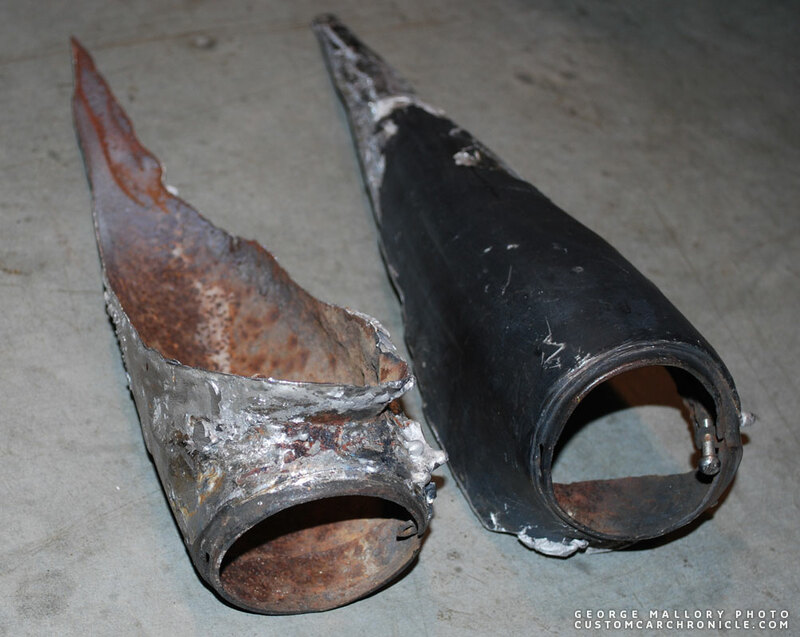 The cut of reshaped ’39 Chevy taillight pods that the Barris Shop installed on the Snooky Janich ’41 Ford around 1953. 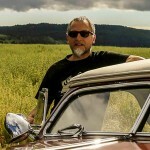 Very interresting : I love this article. Kind of like pulling the curtain back and revealing the Wizard of Oz. Yes, a lot of the work not seen was crude. The “gas hatchet” had yet to see the days of the “whizzer wheel”. There was a mind-set of “do what you had to do” to achieve the outer appearances. So glad the Mallory’s saved and shared these images. Thanks Rik for putting up this article. These were our roots. And roots aren’t always pretty. Time is money when a shop does the work. The craftsmanship today is much better but that is also why it cost sooooo much to have a custom built. Hell it’s still not cheap even if you do it yourself. Get it close and bring on the lead. I love these kind of pictures. One of my favorite things to do when I see Kurt McCormick at a show is to look through the photo album he has on hand of whichever car he brought. Lots if interesting and surprising things to see behind Oz’s curtain as Larry stated. Great article Rik! I really enjoyed seeing these behind the scene pictures. Some of the work may have been crude but the overall look is something epic that we still love to this day. Hopefully we can get more behind the scenes articles like this on some other shops. I love stuff like this- it brings out the historian in me. So fascinating to see behind-the-scenes and get an idea of the work involved. A lot of the early work was pretty basic compared to the quality of work coming out of hot rod and custom shops today, and for obvious reasons- changing trends, practicality, time involved, etc. More terrific behind-the-sheetmetal stuff Rik! 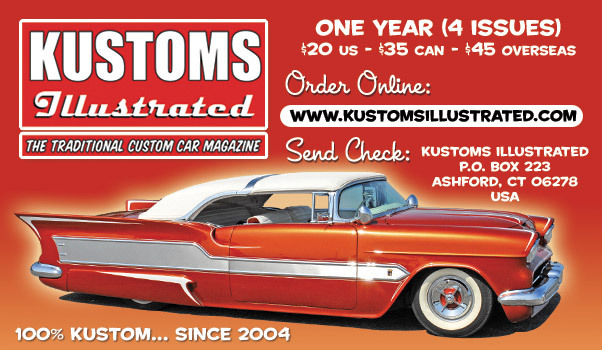 Custom shop customers have always tried to get the best appearing car for the fewest dollars.. The “Joneses” are just harder to keep up with these days!! Thanks once again for another insightful article on the history of our favourite hobby, and thanks too to the Mallorys and others for documenting this stuff!